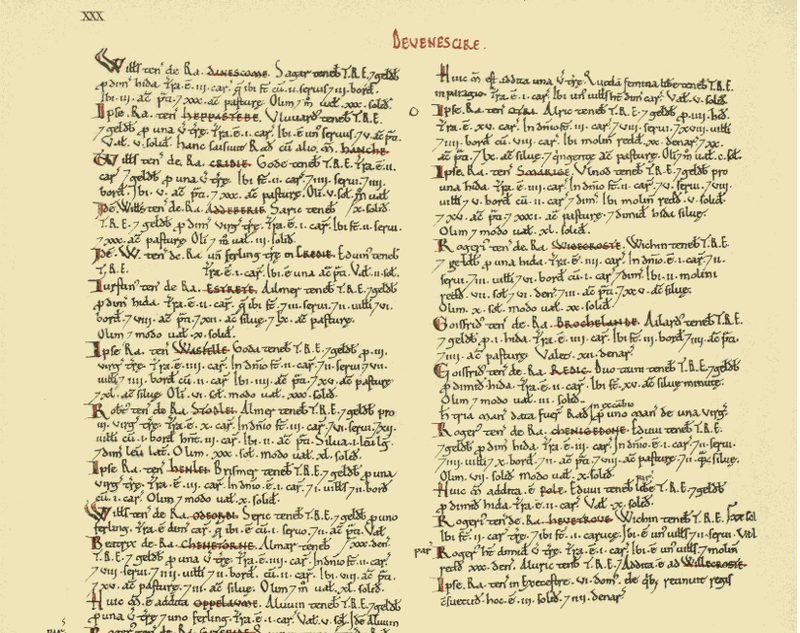 Of course, this bodes well for my large-scale project, because the Domesday site also incorporates IMAGES OF THE ENTIRE TEXT– with English annotations to the side. I’m unspeakably excited about finding this source (which is free, miraculously). On a more personal level, the site helps me imagine my family history. My first documented ancestor is Ralph de la Pommerai, or Pomeroy. 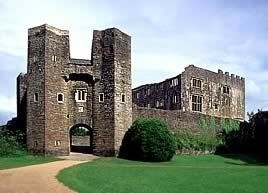 He is recorded in the Domesday Book as lord of Berry [of] Pomeroy, whose castle is pictured right. I’ve spent countless hours wondering what life might have been like here, even in its original structure, but had very little material with which to work. It’s really fascinating for me to have Ralph Pomeroy’s holdings– human, animal, and land– seen in this way. 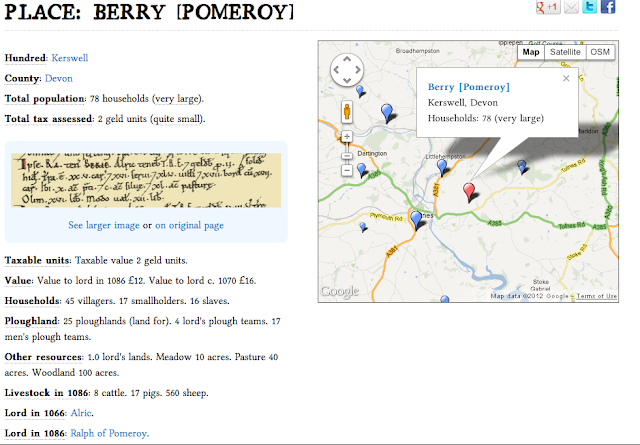 The Berry had 45 villagers, 17 smallholders, and 16 slaves. Land for 25 ploughlands was worked by 4 lord’s teams and 17 men’s teams; although a seemingly large population, it paid relatively low tax. How had Ralph managed that? What was his relationship like with William the Conqueror, who landed him in the first place? With 560 sheep, how often did he eat mutton? Clicking on him brought me to a map of all sites associated with his name (even if not the same person, as the disclaimer notes). I found that his holdings extended beyond that one (now purportedly haunted) castle ruins that I’ve known about for so long. Not surprisingly, all 136 locations affiliated with Ralph Pomeroy are in Devon. 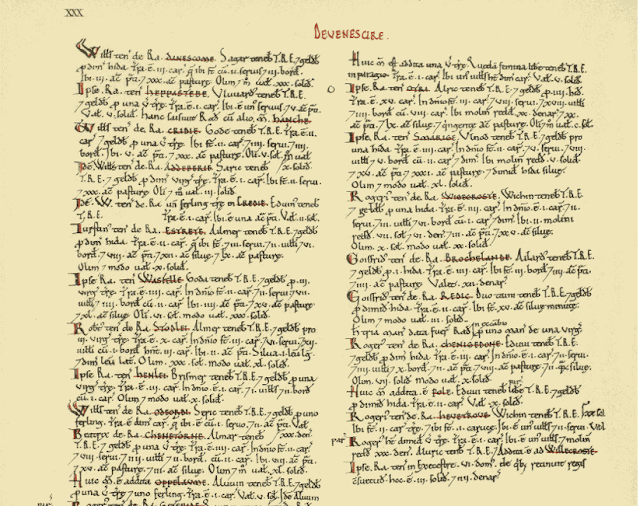 As excited as I am to find personal, familial fulfillment in this project, I’m perhaps equally enthused by its implications for mapping the Anglo-Saxon Chronicles. Who knows what someone else might find? What personal or academic impact might my project, even in its smallest version, have on someone else? And this is exactly my purpose, as I’ve written about in earlier posts. There is a problem with medievalists, their sources, their audiences, and accessibility. Amazingly, this map– a form perhaps first employed to mark boundaries– is now breaking them down.